The popular Taiwanese idol drama Office Girls is giving its fans some free goodies. A eBook of Office Girls drama series is now available for free download for Android mobile devices and iPad tablet. The free eBook is named Office Girls Workplace Strategy Manual (小資女孩向前衝 職場攻略手冊). 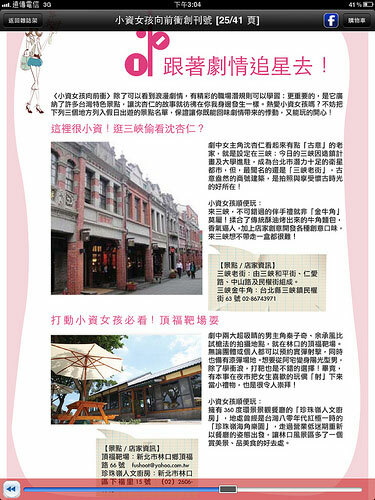 The e-Book contains contents about plot summary and characters analysis of Office Girls, plus survival guide for office ladies, personality analysis test for working female, guide on fashion, hairstyle and makeup for office ladies, introduction to popular products in drama, recipe for healthy yet delicious 50 Taiwanese dollars breakfast, and last but not least, the filming sets of Office Girls. The Office Girls Workplace Strategy Manual is released on the QuMedia-MagShop (酷米) digital publishing platform, and as such fans who want to download the e-Book has to first download and install the QuMedia-MagShop reading app named “樂讀” from App Store (iPad only) or Android Market. Then, get the Office Girls Workplace Strategy Manual from magshop.qmedia.mobi from within the app. The e-Book is free, and is available while stock lasts as limited edition.